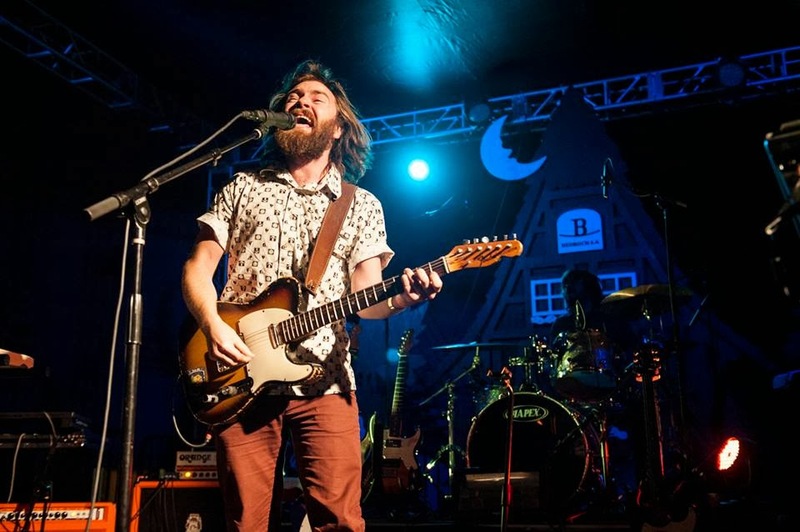 Bedrock LA is called a ‘musical mecca’ for good reason: it’s pretty much one-stop shopping for the musical needs of the many whether it’s rehearsal space, recording time or pesky amp repair. And the place is massive. Huge, even. 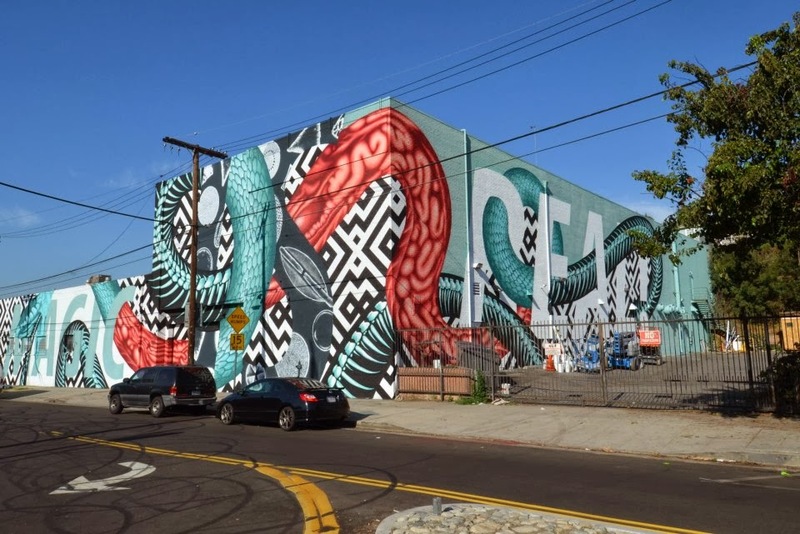 Yet it’s cozily nestled in a residential area of the Los Angeles neighborhood of Echo Park supporting and servicing local musicians and those just passing through. By the time you read this, the first annual LA Weekly Bedrocktoberfest (which took place on October 5th) featuring performances from RZA (Wu-Tang Clan), Liam Finn and Vanaprasta along with the magical stylings of Rob Zabrecky, David & Leeman and Jon Armstrong will have come and gone and that’s fine: we were there and it was a good time. But other than the heady scent of beer, what remains is the heart of and the intent behind such an eclectic fun-fest: Music and community. Marvelously and stylishly clad in what looked to be fairly traditional lederhosen, Kamran V. (Bedrock LA and Bedrocktoberfest co-founder) was more than happy to talk about the idea and spirit of Bedrocktoberfest. 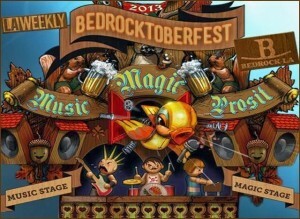 HV: Tell us about Bedrocktoberfest. Kamran V: It is music, magic and prost meaning beer. We’ve had a longstanding, great relationship with LA Weekly and we’ve had a long, good standing relationship with all of the artists that are here. HV: I’ve heard that from several who rehearse here, work here. So this seems like a natural progression. Kamran V: This is just for fun. Truly just for fun. Beer, magic, music: It just all fits together. HV: How did the magic come into play? Kamran V:: The magic was a result of multiple things. 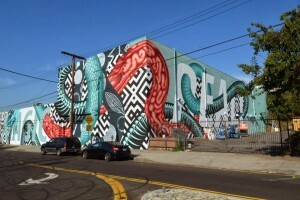 So you see there’s “Magic Is Real.” Some friends Cyrcle, they’re artists made that mural [Magic Is Real] in 33-1/3 days which happened to be my 33-1/3 birthday which happens to be the RPM on a record, and we said you can do whatever you want and they put that “Magic Is Real” and we felt like it represented what was happening inside. The musicians doing their magic or whatever, and then the LA Weekly has been doing a lot of things with magic which is kind of cool. When we were brainstorming this idea we thought oh that’s kind of a unique idea, what if we did magic. We’ve had actually magicians here before in the pinball room just for fun, and there’s this natural sort of kinship between magicians and musicians even though magicians are typically more geeky and musicians are typically cooler, but we’re all geeky. I just realized maybe it’s this mode of being that magicians and musicians share that brings this kinship. It’s just like when you’re in this kind of creative activity you sort of wear your character on your sleeve. Like when you’re a musician you are that musician, like you can’t really fake it, and magician-wise, same thing. You embody that character. You are it. You can’t just change it up, otherwise it feels un-genuine. So maybe that mode of thinking sort of leads to this. And for all of that long-winded explanation, it feels natural. HV: I got this this Liam Finn when I was talking to him earlier and he was just so impressed with rehearsing here yesterday and how laid back, how easy going and how communal things feel around here that he’s almost not ready to go back home to Brooklyn. One of my favorite things about this part of town is that Echo Park and Silver Lake have become a very communal hub. HV: Where in most music areas it was so dog-eat-dog. One of the best things I’ve seen the past few years is how bands have supported each other and how local businesses have been supporting the music and Bedrock is a really good hub of musician support. Which it’s your job, but at the same time there’s no law that says you don’t have to be dicks about it. 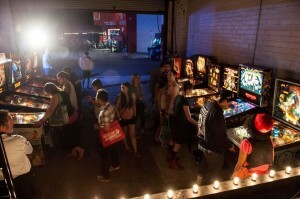 Kamran V: There’s pinball machines. Molly’s got all her pinball machines here, so it’s just much like the way the magic that are Bedrocktoberfest, all that stuff, it just is a natural thing. We want to provide a service that we would want to partake in, also. It’s really important that we are part of that creative community in a meaningful way and the business community in these neighborhoods, like you mentioned, in a meaningful way because we’re all lucky to be here at this time. It’s really incredible. And what’s neat about it is, at least from my point of view, but I feel like the way these neighborhoods kind of came up now there is some gentrification. I feel like it’s generally very inclusive and it’s not a neighborhood pushing out locals. It’s the locals and the new people coming in and embracing each other and doing something unique, so it’s kind of interesting. It doesn’t always happen that way. HV: The last time I was here, I remember going upstairs and seeing a lot of construction going on. So now you’re up to 100 rooms? Kamran V:: About 100, yeah. Kamran V: Yeah well it’s just demand. We’re 100% full. I mean every time someone leaves, right away someone comes in. Kamran V: And it’s a really good problem to have, obviously. We just grow the business side in different ways, mostly because people ask for stuff. Like what’s enabling this festival is for the past couple of years we’ve grown our rental division and we have all this gear now and that way we can do something like this on our own. LA Weekly is our partner, but we’re taking care of all the production part. HV: And you do that for other festivals, too. Kamran V: Yeah, we’ve done that. I mean we don’t do massive things. I mean we’re not that kind of company, but we do smaller things. It’s cool. Of course you have a ton of local bands who rehearse here. Liam [Finn] is debuting brand new stuff with his new band. That’s really what we want this to be, bands that are that comfortable with this place and the people that are in this neighborhood to just do it, just because. There’s no agenda, it’s not that I ask them to do that. They just are doing it just because it works. Like I just hit up Liam and I say, “Hey man”, I hung out with him about a year ago when he was about to get into a new record and I said, “Hey I hear you’re doing a new album, wanna out here and do something?” “Sure.” He came out. He came here when we first opened this place. We borrowed gear for a gig. I found him when I was doing Spaceland recordings and did a couple of albums with him and it just worked…it just happens. We’re so lucky, it just happens. HV: And you’ve been here since 2009? Kamran V: 2009, we’ve been here about five years. HV: What have been some of the great albums recorded here? Kamran V: You know what, it’s mostly rehearsals. We’ve done a lot of recordings. Fitz and the Tantrums actually did some demos for their new record here. Vanaprasta’s done a lot of recording here. Divine Fits did all their preproduction here, they actually picked the band here. HV: I remember when Divine Fits were here. Kamran V: Beck did all this stuff before the Serge Gainsbourg Tribute that he did at Hollywood Bowl. Eagles of Death Metal are working on their new record right now here. HV: I thought I saw Jesse [Hughes] wondering around. Kamran V: Yeah, Jesse is running around. I mean there’s 100 rooms here turning over. Naked and Famous just did all their pre-production here. They had a room and Justin Meldal-Johnsen (Nine Inch Nails, Beck, Neon Trees, M83) was here producing that record. This isn’t the fanciest studio in the world, it seems to be where…like the point of inspiration for those things and people sometimes will track here, sometimes they’re just rehearse here, sometimes they’ll do pre-production here. We’re just here to do whatever they need. Kamran V: The magic [laughs]. We’re here for the magic. 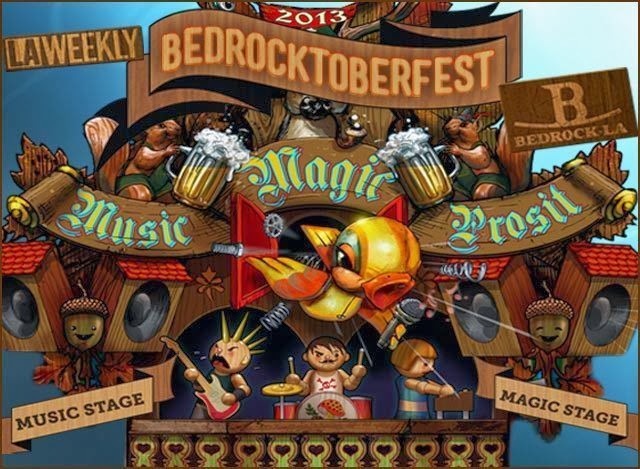 NOTE: Mark your calendars, kids: Bedrocktoberfest 2014 is already in the works: Saturday, September 27th!